Parkside Regeneration is a joint venture between developers Langtree and St Helens Council, to regenerate the former Colliery at Parkside, Newton-le-Willows which closed in 1992. The proposal is to transform the derelict site located on the south-eastern edge of Newton-le-Willows into a new employment park, which will include a major rail freight terminal. The plans for the site have been a subject of lengthy debate for many years, with strong opposition from the local residents. However in 2014 redevelopment plans of the former colliery into a major rail freight terminal were received by the joint venture company Parkside Regeneration, involving St Helens Council and investment and development company Langtree who acquired the site. In January 2017 a draft master plan for Phase 1 of Parkside was consulted on, with two consultation events being held. Having listened to the feedback and comments from these two events the master plan was modified to accommodate the feedback and a planning application has now been prepared and will be submitted on 31st July 2017, with the consultation period running to the 17th September 2017. Parkside will affect areas of 3 Borough Councils – St Helens Borough Council, Wigan Borough Council and Warrington Borough Council. Local businesses and residents in Newton-Le-Willows and Winwick recently received a newsletter on the recent consultation; however, residents also affected by the proposals in the nearby vicinities of Golborne, Lowton and Croft were not included. The yellow route starts at the easterly direction to a junction with the A573 Parkside Road. It then follows a north easterly direction via the A573 crossing over the M6. A change to a south easterly direction follows until it meets the A579 Winwick Lane. The route turns in a south-westerly direction to connect up with M6 Junction 22. As part of the Parkside Regeneration scheme, St Helens Council and its consultants have also undertaken a review to develop a link road from the A49 Newton-le-Willows to Junction 22 of the M6. The link road will affect properties within the St Helens, Warrington and Wigan Council areas. Some of these properties are situated on the boundary line of a Council area such as Warrington or Wigan but will be dramatically impacted by the plans St Helens Council are proposing on the other side of the road to where their property is situated. Many local residents may be unaware of the proposals, particularly in the Warrington and Wigan Boroughs as a leaflet was only distributed to people within 100m of the proposed road and advertised only in the St Helens press and on their website to date. A number of route options were considered and each option assessed against the transport planning objectives, economic, environmental and social impacts. Based on the assessments the preferred route is shown on the above plan in yellow. This route will now go forward for further detailed design and consultation with the public. St Helens Council and its consultants believe the yellow route offers the best solution in order to reduce traffic levels on local roads, improve journey times, allow ease of access on to the M6 at Junction 22 and divert traffic away from local villages. 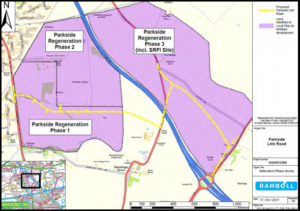 In addition to this, the yellow route will enable the full growth potential of the Parkside site and the facilitation of a potential strategic rail freight interchange can be achieved. A shared cycleway and footway will run along the whole of the new road, except for the existing footway on Parkside Road over the M6. The Link Road traffic model assessment projects an extra 6,173 vehicle movements a day when Phase 3 is completed. This is likely to be a conservative assessment as the Prologis traffic assessment estimated an increase in 6900 HGV movements per day, which does not include commuter travel!!! No other conveyancing search company provides the level of supplementary information and attention to detail that Pali includes in its searches. For many years now, we have always flagged up the possibility of the Parkside regeneration scheme on our searches for affected properties. Our comprehensive local knowledge means we are able to provide you with the most up to date and accurate information regarding Parkside, should your property transaction fall within St Helens, Warrington or Wigan Borough Council. Our aim is to ensure you have all the information at your finger tips to give your buyer peace of mind when progressing with their purchase. Originally posted here by Caroline Hymers. This entry was posted in blog, environment, Property Market and tagged Business, Conveyancing, Environment, Pali, Pali Warrington. Bookmark the permalink.